Tartan Day is celebrated on April 6th in both America and Canada. In Canada it has been celebrated since 1993, with America following suit in 1998. The date April 6th was chosen as this commemorates the date that the Declaration of Arbroath was signed in 1320. It was a declaration of independence from English rule. a very small excerpt states "Man has a right to freedom and a duty to defend it with his life"
And why is the Declaration of Arbroath so important in American history? The main reason is that the American Declaration of Independence was modeled on that famous document. So what is Tartan Day? It is a celebration of the strong links which exist between both Americans and Canadians with Scottish ancestry, and the old Country. And it celebrates the many and important contributions that the Scots-Americans and Scots-Canadians have made to the foundation development and prosperity of the North American Continent. In 2002 the Tunes of Glory Parade saw 10,000 massed pipes and drums march through the streets of New York, the biggest assembly of pipe bands ever, to the absolute delight of the tens of thousands who lined the route. And in 2005 history was made when one of Scotland's national treasures left Scotland for the first time in 700 years. The sword which had belonged to William Wallace, was flown to New York to play its part in the celebrations. Since its beginnings in 1998 Tartan Day is now recognized as a national holiday In both America and Canada, and the event is growing in popularity every year as more and more people are celebrating their Scottish heritage. 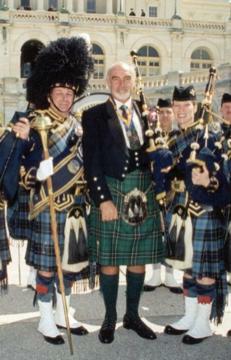 Scotland's most famous actor Sean Connery, has been seen to support the event in various cities across America over the years. Below you can see him attending the celebrations in Washington DC. Its widely known that he encourages cultural links to his homeland, as he is very proud of being a Scotsman, and relishes the chance to wear the kilt, and promote stronger ties between North America and Scotland. Have you attended these celebrations in your town or city? Do you have a kilt/tartan related story you would like to share with other visitors to this web site? If so I would love to include it on the "Your Kilt Story" section of this site, either click on the link or use the navigation bar on the left. I am certain given the success of the event in both America and Canada, that it will continue to grow in popularity, and further strengthen the already close ties between these two countries and Scotland.